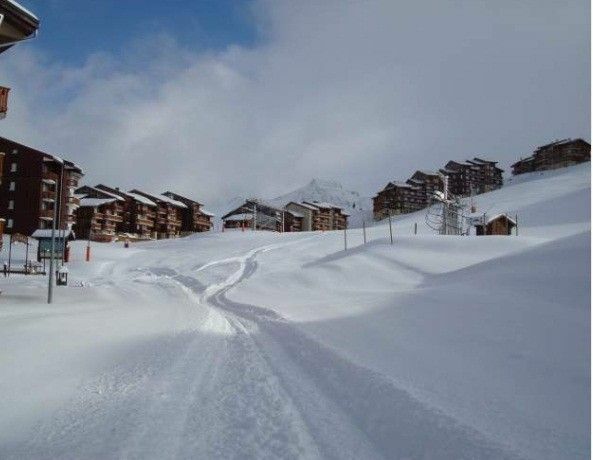 Flat Plagne Village 4 people on the slopes! Studio located in the residence Les Hameaux 1 on the 1st floor, for 4 people, at the foot of the slopes, in the heart of Plagne Village, alt. 2050 m. Departure and return on skis at the foot of the residence. This property is excellent value for money. Studio is right in the heart of Plagne village, on top of the slopes, lifts and free public transport. Bunks and sofa bed were comfy. Lovely and warm with all the equipment you could need. All that was missing was a kettle, but we just used the coffee machine and microwave. WiFi would have been nice but is not universally available in the resort. We rented a ' WiFi in your pocket' from the information centre. For British visitors - English is not universally spoken so you need to give your French a go. Everyone is very friendly though and happy to get by. As with other ski resorts, living expenses are not low so you might want to bring some supplies with you. A very clean, well equipped and decorated studio apartment in an excellent location at a price you will not be able to beat. We only have two suggestions to improve the property, a kettle and a bracket to hold the shower head. Located at over 2000m it is ski in / ski out and offers real convenience with a supermarket, good restaurants and a Ski School within a couple of minutes walk. In addition there is a free cable car to the main centre of the resort (La Plagne Centre) as well as a free bus network that services all resorts in La Plagne. This is the fourth time we have stayed at Plagne Village and this was by far the best accommodation to date. During the booking process, the owners replied very promptly with clear instructions and were happy to accommodate all of our requests and if required are willing to speak English. The resort offers skiing for all abilities and an expert skier will struggle to ski all red/black pistes and off piste areas within a week. If we return to La Plagne next year, we would stay in this apartment again. Sehr gemütliche gut ausgestattete Wohnung, in der zwei Erwachsene mit zwei Kindern gut zurecht kommen. Der Kontakt mit den Vermietern ging problemlos, sie haben rasch geantwortet und können auch Englisch. Alles bestens! Nous avons passé une super semaine avec soleil et neige. Appartement très bien au pied des pistes,bien agencé,bien équipé. Nous le recommandons pour une famille avec deux enfants ou ados. appartement très agréable, très bien situé, très bien équipé et avec de bons couchages. Tout le nécessaire est à proximité immédiate. Je le recommande vivement.